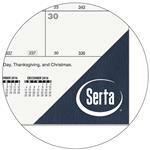 Black calendar desk pad features a different adult coloring pattern on each month and two color imprint. Coloring reduces stress. Doodle on your desk while keeping track of important dates. A 13-month calendar desk pad keeps your message working all year long! Each month features a different adult coloring pattern. Months, dates, and bottom reference calendar are preprinted in black on 60 lb. white offset paper. Padded at top with 13 sheets to a pad, chipboard back and two corners at bottom of pad. Company logo and information printed in designated imprint area in TWO standard colors. Corner Colors: Ink Black, Naval Blue, Chocolate, Thunder Gray, Ruby Red, Evergreen, Burgundy or Cobalt Blue. Imprint Area: Top 21" x 3 1/2"